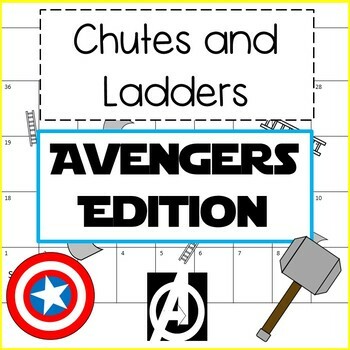 Avengers Edition Chutes and Ladders Game and Activity - Super Fun! This is not your ordinary Chutes and Ladders Game! This Avengers Game and Activity is targeted toward upper elementary, middle, and high school age students. Students can play the Infinity War Edition for fun (no movie knowledge necessary). Then students can make their own edition of the game for End Game (template included). Can they predict what will go down in the movie? Looking to engage your middle or high schoolers even more? Try this Avengers Socratic Dialogue activity: A Study of Thanos, What Makes a Bad Guy a Bad Guy?